Virta Woodard, a 56-year-old diabetic, chats with wellness coach Ryan Manuwa while exercising at Nifty After Fifty fitness centers in Lakewood, Calif. Woodard gets weekly phone calls from her care manager, and she’s started hitting Nifty After Fifty fitness centers since she signed up for a program called “Togetherness” covered by the Blue Cross-Blue Shield insurer Anthem Inc.
“For many people, taking care of their blood pressure or their diabetes is not particularly high on their list when they don’t know where their next meal is coming from,” said Dr. Lori Tishler, vice president of medical affairs with the nonprofit insurer Commonwealth Care Alliance. For decades, they’ve reimbursed mainly for each procedure or service performed, which limits the type of help a doctor can provide. But insurers are shifting more to reimbursement that centers on the patient’s health. That often involves paying providers to coordinate all the help a patient needs to improve their health — and lower health care costs. Virta Woodard, a 56-year-old diabetic, right, and her care manager, Armando Contreras, share a light moment while waiting for a ride after a brief exercise at a gym in Lakewood, Calif. Woodard gets weekly phone calls from her care manager, and she’s started hitting Nifty After Fifty fitness centers since she signed up for a program called “Togetherness” covered by the Blue Cross-Blue Shield insurer Anthem Inc.
“You get a lot more attention to the sickest population,” said Dr. Sam Ho, chief medical officer for UnitedHealthcare, the nation’s largest insurer. 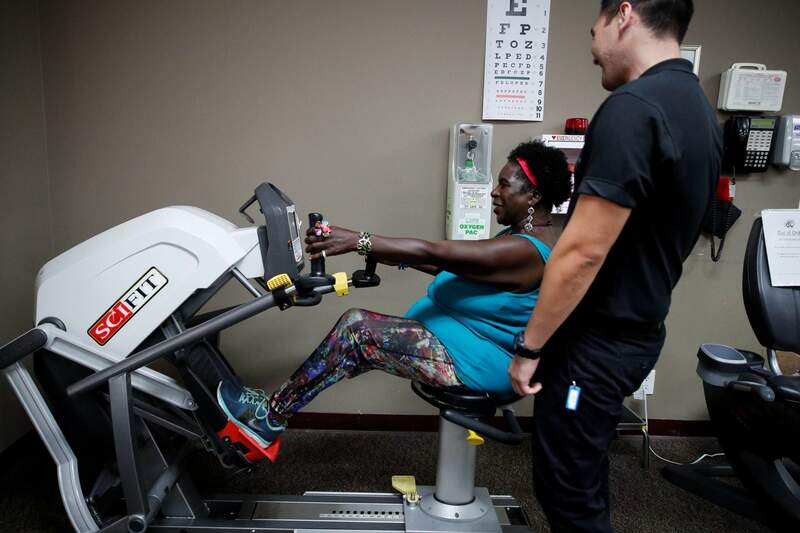 Virta Woodard receives weekly calls from her care manager, Armando Contreras, and she gets rides to a fitness center, all covered under a program called “Togetherness” started last year by the insurer Anthem. The 56-year-old, who has diabetes and lives with chronic pain, has lost 34 pounds since joining the program. Velez, from Mount Sinai Health Partners, spent several hours helping Romano sort through medical bills on her first visit. She also researched companies that could clean Romano’s one-bedroom Manhattan apartment and remove clutter. Then Velez started calling weekly to check in with Romano. “It gave me a little bit of hope that I can get through this,” Romano said. Using a roller walker, Virta Woodard, a 56-year-old diabetic, leaves a gym after a brief exercise in Lakewood, Calif. Woodard gets weekly phone calls from her care manager, Armando Contreras, and she’s started hitting Nifty After Fifty fitness centers since she signed up for a program called “Togetherness” covered by the Blue Cross-Blue Shield insurer Anthem Inc. The Affordable Care Act expanded coverage to millions of people and increased recognition through the health care system that “just giving someone coverage is not going to be enough to ultimately improve health outcomes,” said Samantha Artiga, a Kaiser Family Foundation researcher. 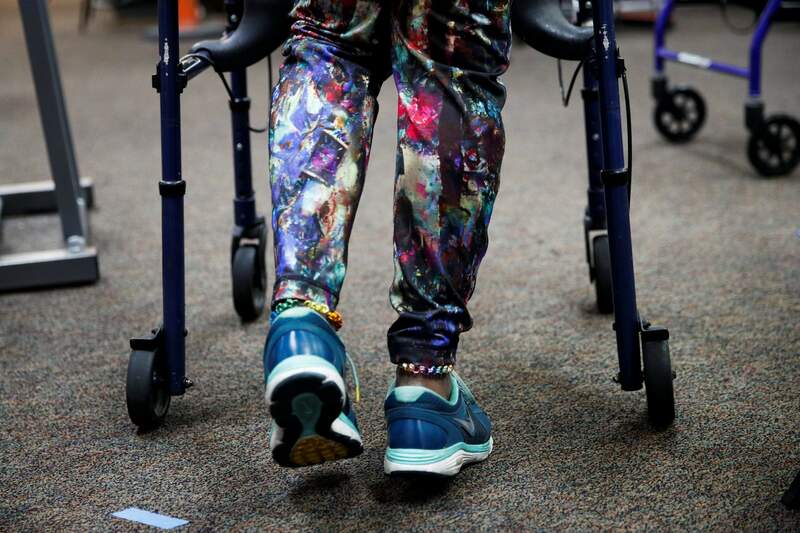 Only about 20 percent of the adjustable factors that determine a person’s health come from care or access to it, according to a 2016 study in the American Journal of Preventive Medicine. Other factors – where a person lives, their income and their diet – combine to play a bigger role. Delivered meals tailored to a person’s medical condition can help keep patients out of the hospital, according to David Waters, CEO of Boston-based Community Servings, which provides food to people with serious or chronic illnesses. He said patients who are sick, don’t speak English or have little money to buy fresh food often struggle to follow doctor orders on diets. “We set people up to fail,” he said. Doctors also like the extra help. Dr. Michael Munger’s practice in Overland Park, Kansas, gets additional revenue to manage care for many of his patients. That allows them to check in to see if anyone is having problems filling prescriptions or making appointments. Success also depends on the patient being willing to accept help and on insurers waiting for the payoff. Near-term expenses from primary care visits or food services may rise, but the payoff – preventing a heart attack because of improved health – might be down the road. “We’re spending all this money, but we’re not getting good results,” she said.